Alas, Compatriots! Mongolia and Tibet are surely lost! Dismemberment is now surely in front of our very eyes. It is surely the end of our 5,000 year-old Chinese civilization! And all surely hangs on whether you, my compatriots, will come to the rescue! Kang Youwei, “Lamentation for Mongolia and Tibet” (1914). The famous Buriat lama Agvan Dorjiev in Russia in the early 20th century. The Russo-Mongolian Agreement at Urga, the Mongolian capital, was followed, in January 1913, by what purported to be a treaty between Mongolia and Tibet. By Article 4 of this treaty, Mongolia and Tibet agreed to ‘afford each other aid against dangers from without and from within.’ The Mongol Government was then under the Russian control, its army was being trained by Russian officers. Buriat monks, Mongolian by race and living in Russian territory, had commenced the training of Tibetan troops at Lhasa. By articles 5 and 6, Mongols were allowed to travel and trade freely in Tibet and to open industrial establishments there. By article 2 of the Urga Convention and its Protocol, Russia received a dominant position in Mongolia. Russian rifles had already been sent to Lhasa by the well-established Urga-Lhasa trade route. The boundary between Mongolia and Tibet is doubtful. It was clear therefore that, if it acted on the treaty, Russia could find indirect means of avoiding the restrictions imposed on Russia and Britain by Articles III and IV of the Tibet portion of the Anglo-Russian Agreement. This ‘treaty’ was concluded on behalf of Tibet by the Russian Buriat, Dorjieff [i.e., “Dorjiev,” aka “Agvan Lubsan Dorjiev”, Tib. Ngag-dbang blo-bzang rdo-rje”], tireless as ever in the work of drawing Russia and Tibet together. His authority was based on a letter given him by the Dalai Lama, when the latter was fleeing from the British Expedition to Lhasa. But the Dalai Lama denied that his letter—which enjoined Dorjieff to work for the Buddhist religion, a not uncommon request—justified anything in the nature of a treaty. Nor does it appear that the Lama or his Government ever ratified the document. Still, there is a danger in such documents, for arguments can be twisted in various ways, and if Russia had insisted on regarding the treaty as genuine, as indeed she was inclined to do, great trouble would have resulted. There are several points in Bell’s description of the treaty that are easily rectified in light of an examination of the actual Tibetan text (just for starters, we may note that neither article 5 nor article 6 of the actual treaty speaks of Tibetans and Mongols opening industrial establishments in each others’ countries). For the present, let us simply note that the dismissive attitude to the treaty that was previously evinced by most commentators in one way or another is linked to Bell’s well-known enunciation of Britain’s view of the document and of the people and politics connected with it. Chinese-language works which deal with the treaty have equally drawn on Bell. Xizang waijiao wenjian 西藏外交文件, compiled by Wang Guangqi 王光祈 in 1929, consists largely (as its title indicates) of translations of those documents relating to Tibet’s contacts with foreign countries presented by Bell in the appendices to Tibet. Past and Present. Commentary for some of the documents, including the Tibeto-Mongol Treaty, is also provided; the short commentary on the treaty is translated in part from Bell. The treaty itself is given in English and Chinese. We may note that Bell’s version of the treaty did not originate with him: it is the translation that was originally included in Henry George Charles Perry-Ayscough and Robert Bruère Otter-Barry’s book, With the Russians in Mongolia. To add to the confusion, that translation was based on a Russian rendering of the Mongol version of the treaty that was then passed on to the British Ambassador in St. Petersburg, G. Buchanan. In short, the version of the treaty that everyone has been working with up to now went from Tibetan to Mongol to Russian to English. From there it was, as we have just seen, rendered into Chinese and even back into Tibetan; the Tibetan version given by Rtsis-dpon Zhwa-sgab-pa Dbang-phyug bde-ldan in Bod-kyi srid-don rgyal-rabs on examination turns out to be nothing other than a translation from the English version found in Bell. I.e., up to just a few years ago the only available Tibetan version of the treaty was not the original Tibetan text but a translation of the English translation of the Russian translation of the Mongol version… One can find the reliance on Bell equally clear in another Chinese work, Zangzu jianshi 藏族简史, which repeats (and cites) Bell’s assertions about the treaty’s status as unfounded rumor—a rumor denied by the Dalai Lama. Tibet and especially for the Dalai Lama, this agreement with Mongolia seemed desirable as a means of manifesting Tibet’s independence and to show that Lhasa does not want to recognize Chinese sovereignty… [A]lthough the agreement between Mongolia and Tibet, because of their legal incapacity, cannot have a political significance and does not deserve the name of the People’s Act, yet it constitutes a protest against the imposition of Chinese sovereignty both on Tibet and Mongolia. That Dorjiev considered the treaty to be the initiative of the Dalai Lama may explain why Dorjiev’s own memoirs say so little about the treaty: “After making a treaty so that henceforth Tibet and Mongolia would be in harmony, I traveled north.” This prompted the translators, Thubten J. Norbu and Dan Martin to note that “Dorjiev makes only passing mention of what was perhaps his greatest diplomatic achievement, the Tibeto-Mongol treaty of January 11, 1913.” Nevertheless, the fact remains that the Dalai Lama was quite evasive with Charles Bell about his involvement in the treaty process and Bell’s testimony on this point, as we have noted, strongly influenced later evaluations of the treaty’s validity. A 2001 Chinese study of British and Russian penetration of Tibet, Yingguo Eguo yu Zhongguo Xizang 英国俄国与中国西藏, departs from the extensive reliance on Bell, where the treaty is concerned, and draws from Russian writings and British Foreign Office materials. The account of the treaty found here notes that correspondence between the British and Russian governments in the first months following the conclusion of the treaty expressed common agreement that it was not a valid international instrument. Nevertheless, the author cites an analysis by David MacDonald, British Trade Agent at Yatung, submitted to the British Foreign Office, that is useful in helping us to get some idea as to the identities of the signatories to the treaty: the Rtse-mgron (“Personal Attendant and Monk [of the Dalai Lama]”) Blo-bzang ngag-dbang is none other than Dorjiev; the Rtse-mgron (“Liason Officer [of the Dalai Lama]”) Ngag-dbang chos-’dzin was the Tibetan official posted at Urga to attend to the affairs of Tibetans considered to be under the protection of the Dalai Lama’s government; Rtse-drung (“Cleric Official [attached to the Potala; i.e., under the Dalai Lama]”) Ye-shes rgya-mtsho was the manager of the Dalai Lama’s considerable financial holdings banked in Urga; and Las-rog drung-yig (“Assistant Secretary”) Dge-’dun skal-bzang served as the assistant to Ye-shes rgya-mtsho. All would have to have been monks. We may add that the Mongol signatory Damdingsürün was one of the leading military figures in the fighting that finally ousted Qing forces from Mongolia. MacDonald was already acquainted with Dorjiev, having met and spoken with him in 1912 in Yatung when the Dalai Lama and his entourage were returning to Lhasa from their exile in India. Dorjiev tried to impress upon the British Trade Agent his lack of antipathy toward the British, but MacDonald was less than enamored of him, writing in 1932 that Dorjiev had become “high in the councils of the Bolsheviki.” Although his name is often given as the equivalent of Ngag-dbang blo-bzang in various Western sources (e.g., “Agvan Lubsan” in the passage from Bell, cited above), Dorjiev’s identity is beyond question, given MacDonald’s knowledge of him, Russian accounts of his role in the treaty, and the fact that he is described as a minister-plenipotentiary empowered to conclude a treaty (Tib. ching-yig bzhag pa dbang-cha sprad pa’i blon) within the text of the instrument itself. Dorjiev’s role in the conclusion of the treaty seems rather ambiguous at first glance. Bell holds that the Dalai Lama never empowered him to undertake such a task, and Bell’s views ultimately colored much of the subsequent opinion on the treaty, Chinese and Western. Bell states that the Dalai Lama had only asked Dorjiev, several years earlier, to take a letter to Mongolia calling for efforts on behalf of Buddhism. There is no reference, I believe, to such a letter in the Dalai lama’s biography. There is reference to a message he sent in 1912 to the Tshal-dam area in Amdo, calling on the Tibetans and Mongols in the area to use the land taxes to achieve even more within the region’s traditional priest-patron relationships, but this would seem to be irrelevant to the question of the treaty. Indeed, the treaty merits no mention whatsoever in the Dalai Lama’s biography—not unlike its treatment in Dorjiev’s autobiography. We are therefore led to consider why it is ignored in this way. It is not as if worldy political events receive no attention in the Dalai Lama’s life story. They are given significant coverage (although the Dalai Lama’s biography itself has oddly enough not received as much attention as it deserves as a source for early 20th century Tibetan history). 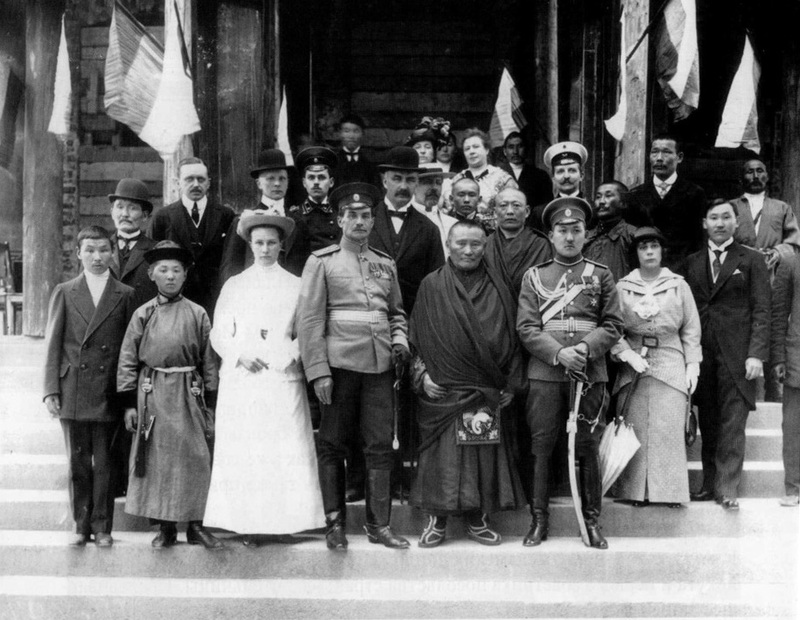 As a point of contrast, we may look at the record of the Dalai Lama’s dispatch of the Tibetan delegation to the Simla conference of 1913-1914. As opposed to the small number of figures known to have been involved with the Tibeto-Mongol treaty, the Simla delegation is quite large and is described in detail. The obvious impression is that the biography does not veer from describing secular political happenings. Ultimately we must consider that the treaty quickly became something of an embarrassment not long after it was signed. The signing was done in good faith and in spite of Bell’s remarks there is no evidence that the signatories ever repudiated it. The validity of the treaty was not dependent on its acceptance by Russia or Britain. But nevertheless, the hostility of Britain to the treaty and Russia’s desire not to exacerbate tensions with Britain led, I would speculate, to a real reticence to publicize it. The fact is, the Dalai Lama had come to realize that Russia would be of no real support to him, while good relations with Britain were extremely important. We can note that references in the Dalai Lama’s biography to his contact with Russians at Wutai Shan are limited to two meetings. While this dearth might seem striking, given that the train of events that brought the Dalai Lama to Wutai Shan can be said to have been set in motion by Russian interest in Tibet, it is understandable, since the Dalai Lama spent the time between late 1904 and late 1906 in Mongolia prior to coming to Wutai Shan and had already had considerable contact there with Russian officials, among them the Russian Ambassador to Beijing, Dmitri Pokotilov. The meetings and discussions that took place in Mongolia yielded very little in terms of substantive Russian support for the Dalai Lama. Thus, when he returned to Tibet from his exile in India he had no illusions about the balance of power between Russia and Britain as far as Tibet was concerned. Downplaying the Tibeto-Mongol Treaty once British displeasure was evident was only natural. But the treaty does exist and it is signed and sealed by officials acting in the capacity of Minister-Plenipotentiaries of the Dalai Lama, with full authority to conclude it. This is quite evident from the content of the treaty. In spite of the equivocation and suspicions voiced about it, it seems inconceivable that the Tibetan signatories would have fabricated evidence of the Dalai Lama’s permission for them to do what they did and then embedded the fraud in the very wording of the document itself. The Tibeto-Mongol Treaty was an assertion of independence on the part of the government of the 13th Dalai Lama. And while this treaty may have been problematic vis-à-vis Tibet’s relationship with Britain, the stance the treaty embodied was real. And that stance remained an annoyance to the Republic of China, which presented itself as a state inclusive of Tibetans and Mongols alike. The presence of what was well-known as “Inner Mongolia” within China’s effective borders mitigated the problem of claims to sovereignty over Mongolia and allowed for the inclusion of Mongols among the peoples making up the Republic of China. But the fact that there was no territory under Chinese rule that was marked as “Tibet” (in spite of much of Khams and A-mdo being under the sometimes shaky rule of Guomindang governors or allied military rulers) imparted a clear sense of Tibetan separateness from the Chinese republic. A cartoon from a Mongolian and Tibetan Affairs Commission publication of 1929 illustrates the view from China. Its message is essentially that Tibet could get much benefit from being part of a large nation, using the image of four of Republican China’s five “races” eating from a big pot labeled “Sanmin zhuyi” 三民主義, the “Three Principles of the People,” the designation for the political philosophy of Sun Yatsen: “You, Tibetans! Don’t just stand there looking! Hurry up and come eat!” The cartoon’s clear implication, however, is that this notion was not too tempting to the 13th Dalai Lama. Ironically, the cartoon’s message has become the position of the present Tibetan Government-in-Exile, its leaders and politicians; but now the People’s Republic of China perceives no need for them in its governance of Tibet. In the light of current realities the Tibeto-Mongol Treaty is a reminder of an era in which a Tibetan government was able to assert its interests as a substantive international actor, and not as a feeble supplicant. Alfred Rubin, “The Position of Tibet in International Law,” The China Quarterly 35, July-Sept. 1968, p. 123. A. Tom Grunfeld, The Making of Modern Tibet (New York, 1987), pp. 62-63: “The text of the ‘treaty’ first appeared in a book published by two British officials who said they obtained the copy from Russian officials in Mongolia in 1913… The text does not appear to have been published in any language other than English…It appears to be a classic case of ‘disinformation’ on the part of Russian colonial officials in Mongolia.” The revised edition of the same book (New York, 1996), p. 65, omits the assertion concerning “disinformation” and repeats the opinion of Charles Bell, Tibet. Past and Present (Oxford, 1924), p. 151: “Nor does it appear that the [Dalai] Lama or his Government ever ratified the document.” Whether Tibetan political practice actually required “ratification” for the validation of such treaties concluded by fully-empowered envoys (as they are described in the treaty) is not addressed. See, for example, Wang Furen and Suo Wenqing, Highlights of Tibetan History (Beijing, 1984), p. 139; and Zhou Weizhou 周伟洲, Ying-E qinlüe woguo Xizang shilüe 英俄侵略我国西藏史略 (Xi’an, 1984), pp. 239-240. Handbooks Prepared Under the Direction of the Historical Section of the Foreign Office. No. 70: Tibet (London, 1920), p. 44. H.E. Richardson, A Short History of Tibet (New York, 1962), p. 106. Parshotam Mehra, “The Mongol-Tibetan Treaty of January 11, 1913,” Journal of Asian History 3.1 (1969), p. 1. Bell, op. cit., pp. 150-151. Wang Guangqi 王光祈, tr. Xizang waijiao wenjian 西藏外交文件 (Taipei, 1973), pp. 20-21 and 129-136. See Henry George Charles Perry-Ayscough and Robert Bruère Otter-Barry, With the Russians in Mongolia (New York, 1914), pp. 10-13; and Zhou Weizhou周伟洲, ed., Yingguo Eguo yu Zhongguo Xizang 英国俄国与中国西藏 (Beijing, 2001), p. 368-369. An archived Mongol text is described in Монголын ард түмний 1911 оны үндэсний эрх чөлөө, тусгаар тогтнолын төлөө тэмцэл (Ulaan Baatar, 1982), pp. 189-190. I am grateful to my colleague Prof. Christopher P. Atwood for providing me with a copy of this work and for his insights on the treaty text contained in it. I am furthermore grateful to him for his kind input regarding the Mongol terms and names in the treaty. On the basis of Dorjiev’s draft of the treaty, described in the important article by Nikolay Tsyrempilov in this collection, it is safe to conclude that the treaty was first drafted in Tibetan and then translated into Mongol. Rtsis-dpon Zhwa-sgab-pa Dbang-phyug bde-ldan, Bod-kyi srid-don rgyal-rabs (Kalimpong, 1976), vol 2, pp. 633-635. Zangzu jianshi bianxiezu 藏族简史编写组, Zangzu jianshi 藏族简史(Lhasa, 1985), p. 365: 一九一三年初，一度虚传由阿旺·德尔智在库仑策划的所谓蒙藏秘密协议内，有蒙藏双方宣布独立，遇事相互援助的谣言，也经达赖本人及其官员辟谣，证明无此事实。. N.b. the document is not termed a “treaty” (Ch. tiaoyue 条约) but an “agreement” (Ch. xieyi 协议). This terminological sleight-of-hand was used in the signing of the famous 1951 “17-Point Agreement on Measures for the Peaceful Liberation of Tibet,” which Tibetans regarded as some sort of treaty but which was carefully framed by China as an agreement (Ch. xieyi; Tib. gros-mthun). As translated by and cited in Nikolai S. Kuleshov, Russia’s Tibet File (Dharamsala, 1996), pp. 114-115. Korostovets was in Urga as the primary Russian signatory to the Russo-Mongol Treaty; see Urgunge Onon and Derrick Pritchatt, Asia’s First Modern Revolution (Leiden, 1989), pp. 41-58. The Russo-Mongol Treaty of 1912 may have served as a model for formal purposes, but the Tibeto-Mongol Treaty is quite different. As translated and cited by Tatiana Shaumian, Tibet. The Great Game and Tsarist Russia (New Delhi, 2000), p. 181. Thubten J. Norbu and Dan Martin, Dorjiev, Memoirs of a Tibetan Diplomat in Hokke-Bunka Kenkyû (=Journal of the Institute for the Comprehensive Study of the Lotus Sûtra), 17 (March, 1991), p. 39. Indeed, a letter to him from the Dalai Lama uses precisely this title (as well as the Mongol “she-cin thong-lag”): see Collected Works of Dalai Lama XIII, vol. 4 (New Delhi, 1981), ff. 113r-113v. I am grateful to Tashi Tsering of the Amnye Machen Institute, Dharamsala, for calling my attention to the letter and its contents. Zhou Weizhou, op. cit., p. 367. MacDonald actually described Ye-shes rgya-mtsho as manager of the Dalai Lama’s “bank.” Rather than the manager of his bank holdings..
 See Onon and Pritchatt, op. cit., pp. 19-21; Urgunge Onen, Mongolian Heroes of the 20th Century (New York, 1976), pp. 77-104; and Christopher P. Atwood, Encyclopedia of Mongolia and the Mongol Empire (New York, 2004) p. 127-128. David MacDonald, Twenty Years in Tibet (Gurgaon, 1991), pp. 97-99. Bell, op. cit., p. 305. Thub bstan byams pa tshul khrims bstan ’dzin, Lhar bcas srid zhi’i gtsug rgyan gong sa rgyal ba’i dbang po bka drin mtshungs med sku phreng bcu gsum pa chen po’i rnam par thar pa rgya mtsho lta bu las mdo tsam brjod pa ngo mtshar rin po che’i phreng ba in Collected Works of Dalai Lama XIII, vols. 6 and 7 (New Delhi, 1982), f. 135v. N.b., all references to this work are to volume 7. The term used in the biography (Khu-ral dngul-khang do dam) and that used in the treaty (Khu-ral dngul-skyes do dam rtse-drung) should be considered simple variants. The most common form is probably the former, given its use in the biography and the understanding communicated to the translators that the institution in question was a “bank” (Tib. dngul-khang). Luciano Petech, Government and Aristocracy in Tibet (Rome, 1973), p. 199. Thub bstan byams pa tshul khrims bstan ’dzin, op. cit. f: 114v: Tsho-sngon Tshal-dam Bod-kyi sa-gnas yin-gshis/ sa-khral bsgrub-rjes Bod-Sog sngar-bas lam-bzang mchod-yon chu-bo gcig-‘dres dgos-rgyu’i bka’-shog gcig bcas ched-du stsal/. Thub bstan byams pa tshul khrims bstan ’dzin, op. cit., ff. 128r-128v: On the 20th [of the Third Month, i.e., April 27, 1913] a farewell audience was granted to those traveling to Darjeeling in India to conclude a final peace treaty for China, Tibet and Britain [Tib., Rgya-Bod-Phyi (sic) gsum]: the splendid administrator, the great nang-blon Bshad-sgra-ba; his assistant, tha’i-ji Khri-smon-pa; the sne-mgron mkhan-chung Bstan-pa dar-rgyas; the fourth-rank official [Tib. rim-bzhi] Rtar-mdo; the fifth-rank official [Tib. rim-lnga] Khyung-ram gzhon-pa; the lay noble official [Tib. shod-mgron] Thub-bstan ngag-dbang; the Cleric Official [attached to the Potala; i.e., under the Dalai Lama; Tib. rtse-drung] Dge-’dun bkra-shis; a servant to watch the bedchambers; the English translator Bstan-pa; a Chinese translator; The ’Bras[-spungs] representative, the monastary’s finance officer [Tib. spyi-so]; the Se-ra representative, Byams-smon-pa; the Dga’-ldan representative, Blo-bzang ’jam-dbyangs; the ’Bras[spungs] doctor, Sbyin-pa; a brgya-dpon as bodyguard; four lding-dpon; and forty regular soldiers. And in the course of it tea was set out in rows and pleasantries exchanged. Those above fourth-rank officials had fried pastries and, from the offices, [given] parting gifts as per their status. The great minister alone had a farewell audience in the living quarters and with it profound instruction of every sort. A high amount of material goods were given. The next day, at the formal departure at Skyid-tshal Klu-sdings [the Dalai Lama] ordered that his representative rtse-mgron [“Liason Officer”] be sent to present protection ribbons, tea, a full silver cup, seven layers of fried pastry And from among the monastic officials, all of these were ordered to go and offer kha-btags [to the departing delegation]: one [representative] from the Za[-sak] and T­­ā [bla-ma], two from the senior monk officers [Tib. mkhan-che], three from the junior monk officers [Tib. mkhan-chung], five from the office departments [Tib. las-mtshan]; and seven from the remaining lay officials.” (tshes nyi-shu nyin ’Phags-yul Rdo-rje-gling-du Rgya-Bod-Phyi-gsum slad-kyi ’jog-bzo’i zhi-chings mdzad-par phebs-mi dpal-ldan srid-’dzin nang-blon chen-po Bshad-sgra-ba dang/ las-rogs tha’i-ji Khri-smon-pa/ sne-mgron mkhan-chung Bstan-pa dar-rgyas/ rim-bzhi Rtar-mdo/ rim-lnga Khyung-ram gzhon-pa/ shod-mgron Thub-bstan ngag-dbang/ rtse-drung Dge-’dun bkra-shis/ gzims-’gag shod-drung gcig/ Phyi-gling yig-sgyur Bstan-pa/ Rgya’i yig-sgyur gcig/ /’Bras-’thus spyi-so/ Ser-’thus Byams-smon-pa/ Dga-’thus Blo-bzang ’jam-dbyangs/ ’Bras-sman sbyin-pa/ sku-srung rgya-dpon gcig/ /lding-dpon bzgi/ dmag-dkyus bzhi-bcu tham-pa bcas-par thon-phyag mjal-kha’i thog /ja-gral bka’-mtshams dang/ rim-bzhi yan-la bzhes-spro/ las-khungs-nas go-babs-kyi thon-rdzongs bcas dang/ blon-chen rkyang-par gzims-chung thon-mjal dang ’brel gang-ci’i bka’-slob zhib-rgyas dang/ dngos-rdzongs spams mtho-bo bcas stsal-zhing/ [f. 128v] phyi-nyin phebs-thon dngos-gzhir skyid-tshal klu-sdings-su sku-tshab rtse-mgron gdong phyag-mdud dang/ gsol-ja dngul-dam gang/ bzhes-spro bdun-brtsegs/ rtse-skor dza-tā’i khongs-nas gcig dang/ mkhan-che gnyis/ mkhan-chung gsum/ las-tshan lnga/ drung-byings bdun bcas-nas go-babs-kyi mjal-dar re ’bul-bar bskyod-dgos bka’- khyab-stsal/ ). See Shaumian, op. cit., pp. 90-125.